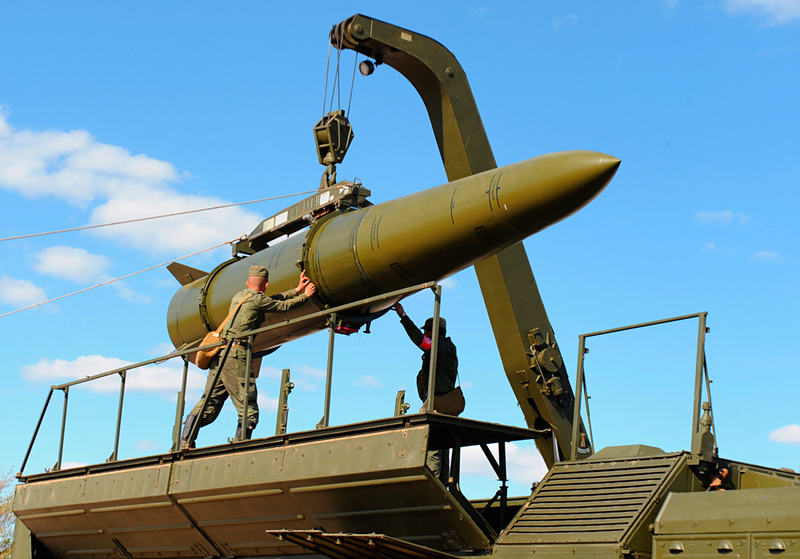 A rocket being loaded into an Iskander-M missile launcher. The Ministry of Defense of the Russian Federation has released a video on its YouTube channel showing the test-firing of a cruise missile from the Iskander-M missile system on a practice range in Southern Russia. The Russian military test-fired cruise missiles of the Iskander-M tactical missile system from the Kapustin Yar practice range in the Astrakhan Region on April 15 (about 620 miles south of Moscow). The missile flew at an altitude of about 45 kilometers (28 miles). The simulated enemy's electronic warfare systems failed to detect the object during the flight and the warhead successfully hit a target 200 kilometers (124 miles) away from the Iskander-M tactical missile system. The footage shows that nothing except for a smoking crater was left at the impact site. The Iskander-M tactical systems are designed to destroy enemy targets at a distance of up to 500 kilometers (310 miles). The missile flies an alterable trajectory with rapid acceleration, which allows it to overcome the enemy's missile defense systems. The time it takes to launch ranges from 4-16 minutes. The system is able to operate in temperatures ranging from -50 to +50 degrees Celsius (-58 to +122 F). Read more: What’s new with the Russian army?